An invitational exhibition open to W. Charles Thompson Museum School Students of all ages held annually in the Attleboro Arts Museum’s Community Gallery during the month of June. 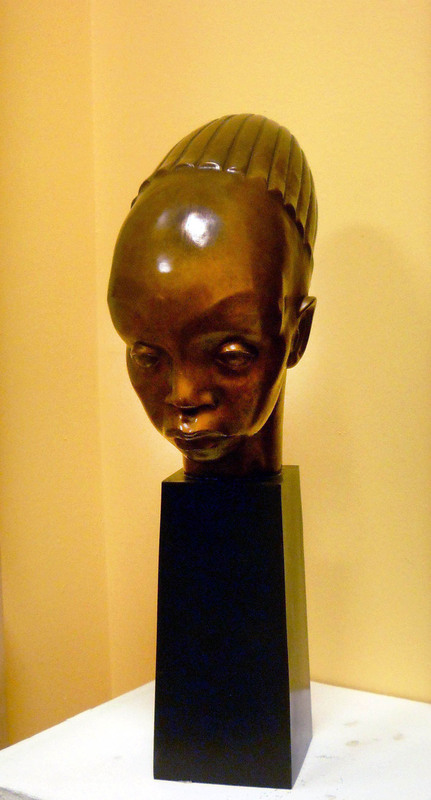 As a result of a generous gift from Mrs. Gene Schreckengost, The Attleboro Arts Museum is the fortunate recipient of Viktor Schreckengost’s 1933 original Mangbetu Child; Bronze Casting #2. Museum visitors and friends treasure this exceptional gift. It serves as a strong symbol of Vik’s talent and the great impact of the Viktor Schreckengost Legacy Exhibition (March 21 – May 16, 2008) at the Attleboro Arts Museum. We have had ten wonderful recipients of the individual Mangbetu Award (2009-2018, see below for past recipients). As of 2019, the Attleboro Arts Museum is expanding the award program to include an annual team of exhibiting artists appearing in The Viktor Schreckengost Mangbetu Art Student Group Exhibition. As a salute to Viktor’s contributions as an educator and remarkable accomplishments as an artist and designer, each year’s exhibit will spotlight one of Viktor’s areas of interest or an art media that he enjoyed working in. The 2019 invitational art student exhibition will be inspired by Viktor’s ceramic sculptures of animals created during 1937 – 1955. Viktor had unique approaches when rendering animals such as a focus on line, simplification of subject and “finding” the animal within formless blobs of clay. Student artworks selected by the Museum’s Programs Coordinator for this group exhibition will have a strong connection to one of Viktor’s many expressive animal sculptures. Exhibition: June 4 – 28, 2019. Summer Gallery Hours are Tues-Sat from 10am-4pm.